As I am currently getting ridiculously fangirly over the second season of the live action drama for this series, I figure now is a good time to talk about this manga! 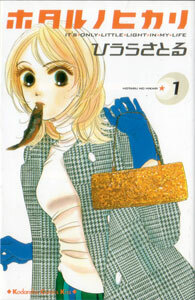 Hotaru no Hikari is a josei manga, or manga aimed at an older audience than your average shoujo fare. This series is aimed at young women in their 20’s, and features a heroine in that age range. It is refreshing to read about life after high school sometimes 🙂 This is an adorable romantic comedy that spans 15 volumes. The art is kind of funny – a bit messy and hard to follow sometimes, but the story makes up for it. I am so happy that they made a second season for the live action, I am so addicted! Our heroine is 27 year-old AMEMIYA Hotaru, an office lady who works for a planning/interior design type of firm. By day, at the office, Hotaru is poised, competent, and stylish. She is admired by her co-workers. However, when she gets home, Hotaru lets it all hang out. In direct contrast to her stylish work wardrobe, Hotaru relaxes at home in beat-up old sweatpants and old t-shirts. Her hair is a funny mess, tied in a ponytail at the top of her head. Instead of going to group parties with her co-workers, Hotaru would rather be lazy at home, reading manga, eating instant food, and enjoying a cold beer while sitting on her porch admiring the stars and fireflies in her yard. She has essentially given up on ‘being a woman’ in the sense that she doesn’t socialize or date, and she is very naive when it comes to romance. The story begins when Hotaru gets an unexpected house guest — a guy named TAKANO Seiichi, her boss from work! It turns out that the house Hotaru is renting belongs to Takano’s father who is away overseas. Due to unforeseen circumstances, Takano needs to move back home. He is totally surprised to see Hotaru living in his home. Is this lazy, sloppy, dried-up-fish woman really his hard-working employing Amemiya-san? Due to a contract Hotaru has with his father, Takano lets her stay in his house, but he really needs to live there too, so they decide to live together. It’s all business/platonic of course. After all, their personalities couldn’t be more different. Takano is 41, handsome, popular, and stylish. His personality is very strict and he is fond of cleanliness. Therefore, he is horrified by the way Hotaru lives, and is constantly repulsed by her sloth-like ways. They have to pretend at work to be just boss and employee, and can’t tell anyone about their living arrangement. As if this wasn’t stressful enough, another big change shakes Hotaru’s world. It is the arrival of TESHIMA Makoto to her department. Makoto is a designer, and is a rising star at their company. He is only 24, but is very talented and capable. When she meets Makoto, Hotaru’s heart skips a beat. He is very handsome. As for Makoto, he is definitely interested in Hotaru. He looks at her with intense eyes, and one day he suddenly kisses her! Oh my! What should Hotaru do? Oh wow, oh wow! She is so flustered and shocked, she has no idea how to handle the situation. Does Makoto like her? If he does, is he really serious? Will she actually get a boyfriend? Hotaru is so naive and unused to be in social/dating situations, she really needs help! Fortunately, Takano is there to help. He witnesses Hotaru’s ridiculous and foolish overreactions to everything Makoto-related, and gives her advice to help her achieve her true love. Acting as sort of a gruff, surly, coach, he stops Hotaru when she is about to do stupid things, and encourages her. Along the way, Hotaru and Takano become good friends, even though he is still completely disgusted and horrified by her lazy slacker home life. Will Hotaru succeed in her romance with Makoto? What will happen if people at work (including Makoto…) find out she is living with Takano? Will she and Takano remain just-friends? How does Takano really feel about her? He is much older than her, after all. But then again, Hotaru is older than Makoto! Hotaru’s exciting love life is about to begin! I haven’t finished the manga yet, but something I like how the author sometimes shows what Makoto is thinking, too, and his reactions to being around Hotaru. He actually noticed her before he joined her department, so seeing a bit of his back story is fun. I also love the relationship between Takano and Hotaru. He observes her sort of like she is a different, abnormal species, and their arguments about stupid things (often involving cleaning) are funny. I look forward to finishing both the manga and the 2nd season of the drama for this series! YAY! There’s a second season of the drama?! Thanks for letting me know! I loved this manga, too!